When summer turns to autumn and the leaves start to fall, something enchanting begins to happen in Neopia. Each year during the Month of Gathering faerie dust fills the air and gifts are bestowed upon Neopians as if by magic. Yes, it's time once again for the most ethereal of Neopian celebrations, the Faerie Festival! Neopians from all across the globe will gather in newly-grounded Faerieland to play music, eat delectable treats, and pay homage to the faeries who bless Neopia with their magic. Undoubtedly, the best way to give thanks to the faeries is by honoring them with your pet's outfit, and there are dozens of beautiful wearables to help you do just that. Like the faeries themselves, these wearables are varied, and range from delicate to opulent to sinister. Perhaps the best way to begin your Faerie Festival customization is deciding which kind of faerie your pet will dress as, but many feel restricted to the six elemental faerie types (Air, Earth, Fire, Light, Dark, and Water). To create a more unique look, I've pulled together four outfits that channel a faerie's spirit rather than her element, and hopefully they will inspire you to do the same! Items Pictured: NC—Sparkling Faerie Wings, Crayon Wrapper Dress, Rainbow Highlight Wig, Pretty Purple Pinwheel Staff, Faerie Make-Up, Delightful Flowering Vines, Colourful Mushroom Foreground. NP—Shoppe of Neggs Background (8,500 NP*). Faeries, as I'm sure most of you know, are by and large benevolent creatures willing to lend a hand to any Neopian in need, so it seems only fitting that we start with an ensemble that emulates the kindest of faeries. You may want to begin planning this outfit by choosing a pair of wings first, as a faerie's wings will set the tone for her personality. I chose Sparkling Faerie Wings, which are both gorgeous and fragile, and bespeak a good faerie's gentle nature. Many other pairs of generic wings exist, such as Sparkling Carmariller Wings or Sugar Cookie Wings (17,500 NP) to get your good faerie fluttering. Keep it simple with your faerie's dress; faeries are natural creatures, and don't like to wear anything too fancy or fussy. Try Flowery Teal Dress for something that's simple but pretty, or Tissue Paper Gem Dress, which offers a bit of sparkle as well. When choosing accessories and trinkets, try to pick items that reflect your good faerie's cheerful outlook like Whimsical Garden Background or Magical Sparkling Happiness Faerie Flower (500,000 NP). If your outfit doesn't have much sparkle to it, finish your look with Faerie Dust Shower, a common but enchanting NC Mall item that works for just about any faerie getup. Items Pictured: NC—Dark Faerie Magic Staff, Gothic Leather Wings, Midnight Frost Dress, Lustrous Long Black Wig, Spyder Web Gloves, Gothic Vine Face Paint, MME3-S3: Flaming Magma Rock Shower. NP—Faerielands Destruction Background (600,000 NP), Cloud of Dark Magic Foreground (55,000 NP), Bloodshot Eye Contacts (22,000 NP), Embers Boots (3,500 NP). For all the good faeries in Neopia there are some who seek to use their magic for mischief and evil, who revel in destruction and wickedness. If your pet has a slightly sinister streak, you may want to consider dressing your pet as an evil faerie for this year's Faerie Festival! Most people automatically associate evil faeries with Dark Faeries, but that is not always the case. 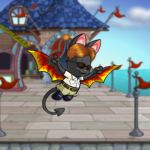 As you can see, the Kyrii in this customization could easily be a Dark Faerie or a Fire Faerie, as both elements are used throughout with items such as Dark Faerie Magic Staff and Embers Boots. If your pet wants a less typical evil faerie look, why not put together an evil Earth Faerie ensemble? Ileres Collectors Wings are great for this, as are Spooky Green Contacts. Evil Water faeries can use gloomier water-themed items such as Underwater Net Background (5,500 NP) or MME9:S4a: Tentacle Skirt. Admittedly, Light and Air Faeries are most difficult when it comes to creating evil faerie looks, but they do exist, like the unnamed Air Faerie from The Three. 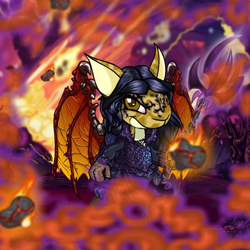 A Dark Winter Hooded Cape and some Gothic Vine Face Paint can transform even the most demure of faeries into a spiteful sprite. Items Pictured: NC—Faerie Cloud Racers Collectors Background, Wheel of Excitement Thought Bubble, Faerieland Team Vuvuzela, New Faerieland Altador Cup Jersey, Games Master Challenge NC Challenge 2010 Gold Medal, Daily Dare NC Challenge Game Controller Belt, Side Ponytail White Wig, Fancy Blue Trousers. NP—Faerie Bubble String Lights (13,000 NP), Taelia Racer Slippers (10,000 NP). Regardless of whether a faerie is good or evil, all of them have one thing in common: they are all very competitive! Faerieland has many amazing games to offer, and there are a variety of wearables to match. Start off with some Faerie Bubbles, as a foreground with Faerie Bubbles Cannon (2,500 NP) or as jewelry with Faerie Bubbles Necklace (3,700 NP). 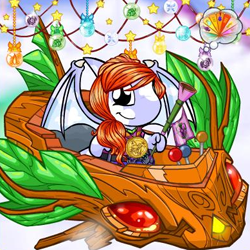 There are also miniature cloud racers like Tooth Faerie Racer (2,500 NP) and Fire Faerie Racer (35,000 NP), as well as Faerie Cloud Racers Garland. Don't forget some Faerieland Altador Cup Team gear to keep Team Faerieland's spirits up in the off season! The Wheel of Excitement Thought Bubble references Faerieland's favorite wheel, but if you've got the Neopoints you may also consider splurging on a Wheel of Excitement Background, an item so rare it has no established price on the Trading Post. Finally, your gamer faerie won't want to be slowed down by gaudy or overly delicate wings, so keep it simple with something basic like Shimmery Summer Wings or any of the Brilliant Faerie Wings (they come in Blue, Green, Purple, Red, and Yellow). You can also use your pet's natural wings, like this Cloud Shoyru. Items Pictured: NC—Autumn Faerie Dress, Golden Key Necklace, Pretty Dark Wig, Autumn Leaf Face Paint, Breezy Autumn Path Background, Autumn Leaf Garland, Harvest Frame, Seasonal Autumn Rake. NP—Illusens Laced Slippers (6,000 NP). Instead of elements, some faeries are associated with specific seasons, like Kari the Negg Faerie. 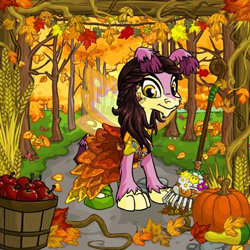 One of the best ways to make your Faerie Festival customization original is by picking a certain season's theme for your pet's faerie getup. I chose an autumn faerie outfit for this Ogrin because the Faerie Festival is in the Month of Gathering, but there are endless possibilities. Spring faeries are probably the easiest, as many faerie-themed items already come in the bright and pastel colors of spring, not to mention most faeries love the flowers that can be found in backgrounds like Spring Path Background (18,000 NP). There are also some great options for Day of Giving or winter faeries, such as Seasonal Wings (15,500 NP) and Sparkling Snowflake Wings, and you can't go wrong with items from the Peppermint Queen Superpack released last year. Summer faeries will love relaxing on the beach in a Floral Summer Dress or Cheerful Watermelon Top and its matching skirt. You can get even more specific if you want; how about a Halloween faerie, or a Valentine's Day faerie? Whatever you choose, your seasonal faerie is sure to bring a unique holiday spirit to the Festival! Items Pictured: NC—Feet in the Clouds Foreground, Fyora Collectors Dress, Fyora Collectors Staff, Entrance to Fyoras Castle Background, Fyora Wig, Pretty Pastel Shoes & Tights, Fyora Wing Garland, Pink Lulu Contacts, Neopian Clouds Garland. NP—Faerie Queen Wings (500,000 NP), Fyora Arm Wraps. 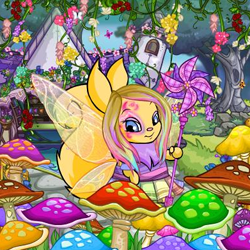 None of the looks featured so far have been based off a specific faerie, but as Queen, Fyora deserves her own outfit for the Faerie Festival. The TNT artists have been more than happy to oblige us with several wearables dedicated to the Faerie Queen herself, including her dress, staff, wings, and two wigs (the one not pictured here is Fyora Inspired Wig and Hat) to get your Fyora customization going. Because Fyora is beloved by all and has a great sense of style, many of her items are expensive or hard to find. Fyora Arm Wraps are especially difficult to come by, and as such there is no established price for them. But that doesn't mean your pet will have to go without; pick one traditional Fyora item, like Entrance to Fyoras Castle Background or Fyora Wig and use similar looking items for the rest. Silk Wig with Flowers is a great hair substitute, and Luminous Seashell Staff makes a good imitation Fyora Collectors Staff. For an outfit, concern yourself less with getting the style of Fyora's dress right and instead find something with the right shade of lilac, which can be achieved with Lavender Lace Shirt and Lavender Lace Jacket. Overall, try to emulate Fyora's regal air and compassionate nature in your pet's customization. 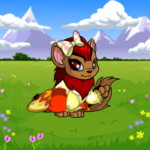 There are endless options for creating a faerie customization for your pet, and I hope this article has given you a few ideas to help you start planning. With the right outfit and just a pinch of faerie dust, this year's Faerie Festival is sure to be the best ever!